To put this into other terms, this is an accomplice of the experimenter, acting a specific role. They help create the situation, in which the reactions/actions of the study participant are being investigated. The fact that the confederate’s actions are controlled by the experimenter is hidden from the participant via various cover stories, e.g. that they are other participants. Virtual Confederates are virtual humans used in place of the actor. The key to this is that the virtual human has to be perceived as another being, not an avatar (i.e. our definition of virtual human). How to virtual confederates stack up against human confederates? always deliver the same performance. Virtual Humans are computer programs, they do as they are told every time. This can be the exact same or have some variability programmed into it. inflexible. Virtual Humans can only react as they have been programmed to react. Humans can respond on the fly. Although this is seemingly a negative, it might really be a positive, because those human adaptations might introduce confounds. Therefore the participant really should not be included in the final data. A problem though remains, as a non-response from the Virtual Human may break the illusion of it being a human, leading to a worse confound. repeatability Once programmed, the scenario can be exactly repeated was needed. The same virtual humans can be used every time, even years later if extra participants have to be run for publication. The program can be run by other people at another time and place. This provides a new level of repeatability to studies. always available. No scheduling conflicts exist with the virtual humans. The will show up on time, every time. Even years later. cost. Virtual Humans incur a one time cost to create them. It doesn’t increase with the size of the participant pool. Humans, particularly trained actors, are prohibitively expensive. emotional control and consistency. Virtual Humans act with the same emotions every time they perform. Humans may not always control their emotions well when they have to act in stressful situations. For instance in the classical Trier Social Stress Test, an important factor is being emotionally neutral. No empathy should be shown. Virtual Humans will act as they have been designed to act, without emotion. 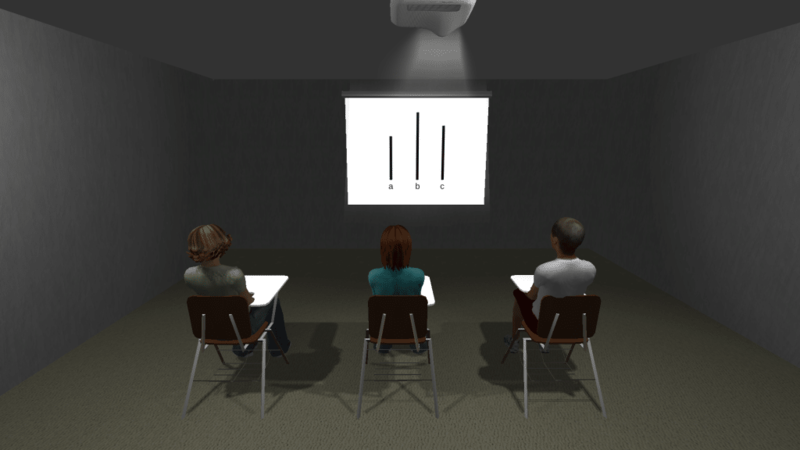 The virtual Trier Social Stress Test (vTSST) application by Virtual Human Technologies. – emotional expression. Emotional expressions of Virtual Humans is not yet developed to the subtle levels of humans. This introduces a possible confound. Research groups are working on the technical aspects, but psychology based research really needs to be performed. Still, avatars are already being used for emotion expression work, such as work by the Life is Game (http://www.portointeractivecenter.org/lifeisgame/) project. This is one of various efforts to help autistic children learn facial expression in a new way. Though not strictly Virtual Humans, these avatars are helping people. Life Is Game Project. http://www.portointeractivecenter.org/lifeisgame. As we can see Virtual Confederates mostly have advantages over their human counterparts in a head to head comparison. There are even more advantages to Virtual Confederates that really go beyond a direct comparison. With Virtual Confederates we can do some things that are infeasible or even impossible with humans. In part 2, we’ll discuss things that virtual confederates make possible that are not feasible with human confederates. The biggest caveat is that Virtual Confederates are not yet proven for research. They have been used in a few studies, but not yet strictly validated. Part 2 will highlight some of the existing studies. The adoption of Virtual Humans in such studies will continue. We are happy to be a part of the coming explosion of new Virtual Confederates and to work with researchers in validating and shaping this exciting area.